Face masks are having a moment right now, with Instagram posts galore of celebs and lifestyle bloggers donning sheet masks, clay masks, and gel masks of every variety. And for good reason! They’re a great way to get that coveted tingly clean sensation, to deepy infuse ingredients into your pores, and to retexturize your dermis so its at its smoothest and most radiant. 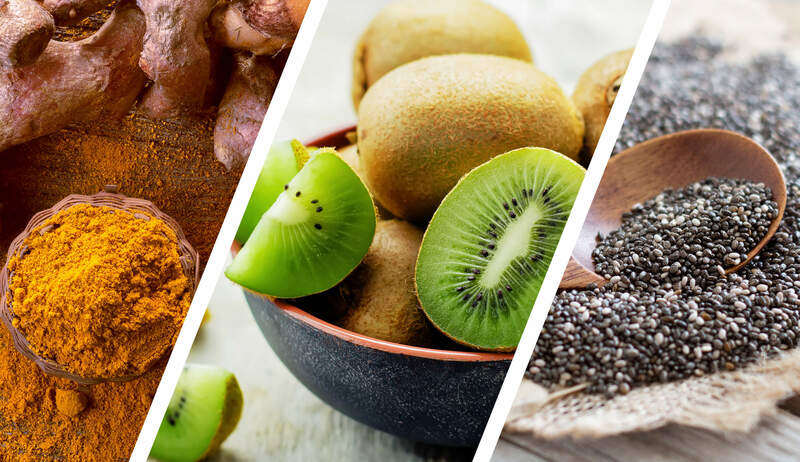 And while there are a number of amazing and highly effective products that you can buy pre-made, there’s also a world to explore in your pantry. The best face masks, in fact, can be made at home. One of the biggest perks of face masks is that they are ultra effective at brightening your complexion. Brightening in skincare means sloughing off dead and dull skin cells, and invigorating your pores and lipid barrier so that they can effectively produce and process sebum (not too much and not too little is the goal). They can also be ultra effective at fading hyperpigmentation, and revealing fresh skin beneath. Brightening ingredients happen to occur naturally in a variety of fruits and plant-based kitchen essentials – the key is using ingredients with enzymes. Enzymes are the chemicals present in fruit that help them ripen, and when applied topically, are useful for both exfoliation and anti-inflammation. 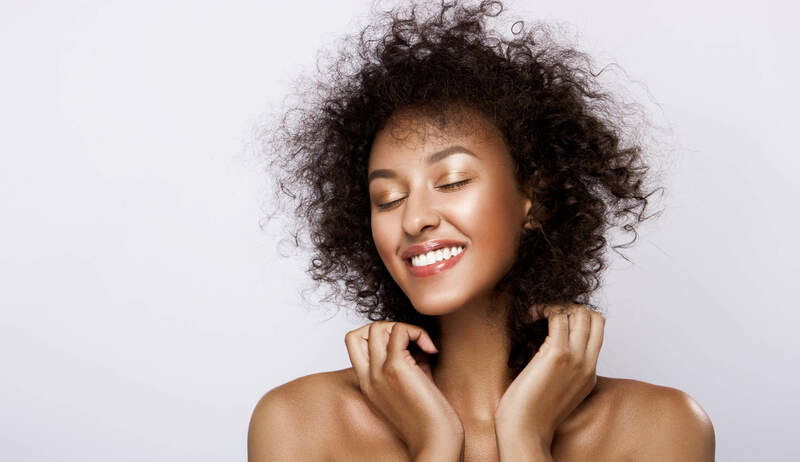 The outer layer of your skin is primarily composed of dead skin cells that contain the protein keratin. When enzymes interact with this outer barrier, they break down some of the keratin, speeding up the process by which dead skin cells are removed and new skin beneath can be revealed. We’ve rounded up three ultra brightening DIY face masks, so you can get your glow on from home! 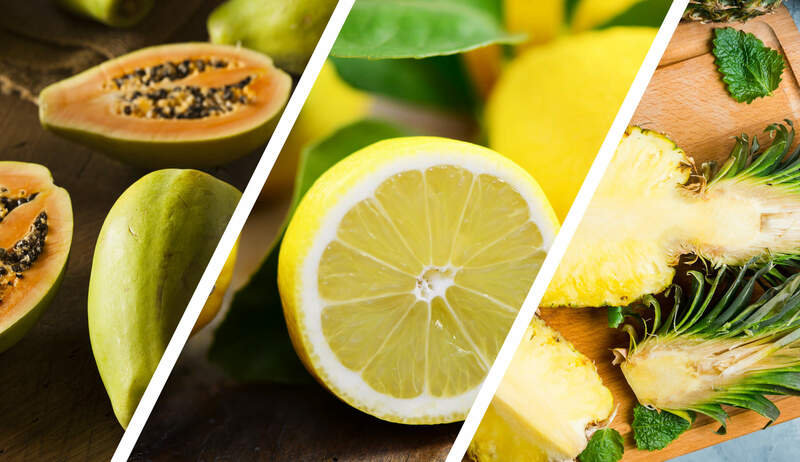 This skincare recipe makes use of a powerful trifecta, combining three fruits with re-texturizing and radiance boosting properties. Lemon contains alpha hydroxy acid, an exfoliant that removes dead skin cells and generates new ones. Lemon is also a powerful source of Vitamin C, for brightening discoloration and hyperpigmentation. Papayas boast the enzyme papain, a powerful exfoliator that dissolves build-up in pores (and can also inhibit hair growth on the face, a bonus). Pineapple completes the synergy, with bromelain enzymes helping to treat acne and heal past blemishes, and nourish the skin so that it’s firm and flexible. Combine ½ fresh papaya, ½ cup fresh pineapple, and a quarter of a lemon in a blender with 2 tablespoons of water. Blend, then strain out the fiber so that only the liquid remains. Mix the liquid with a tablespoon of natural bentonite clay (or ground oatmeal as a skin-loving replacement) to thicken the mixture. Apply a layer with a cotton ball and let it soak in for 10-15 minutes. It may gently sting and tingle - this means that it’s working! Gently wash off with warm water, and apply a toner and moisturizer. We like to use Puristry Flower Water Toner at this step, to remove any excess dead skin cells that have been sloughed off during the treatment. This DIY face mask is an absolutely stellar tonic for inflamed or red skin, and will leave you with a soothed, cooled, and hydrated canvas with reduced puffiness and increased brightness. Kiwi is the vitamin E factor in this recipe, containing a high percentage of it - key for fighting against the formation of free radicals. Chia binds the recipe together so that it becomes a soothing gel, and also is a powerful humectant, meaning it delivers H20 deep into your pores. Chia seeds are also intensely anti-inflammatory, making this a good mask for eczema sufferers or those with live blemishes. The formula gets its last kick from tumeric (which will give the final product a beautiful golden color). Tumeric is another anti inflammatory and also known to reduce scarring. Take two tablespoons chia and soak them in an equal quantity of water in a bowl. Put aside the mixture for 15 minutes, after which point you will have a gel like consistency. Mash one ultra ripe (slightly soft) kiwi and mix the pulp into the chia. Add one tablespoon of tumeric to the formula, and mix until fully blended. Apply using a face mask brush and let it penetrate for 15-20 minutes. Turmeric will leave a slight yellow hue on your skin, so you may want to use a silicon exfoliating brush to buff it away when you remove the mask! Gently wash with warm water, and apply toner and moisturizer. This face mask is a simple cult favorite, with a variety of benefits and potential to boost with extra add-ins. Honey is ultra anti-microbial, so is an excellent treatment for banishing acne causing bacteria. 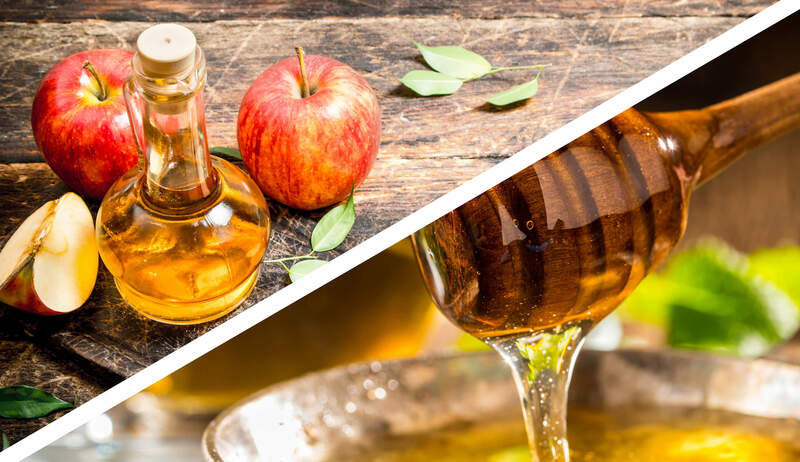 Apple cider vinegar is an all natural astringent, which works to absorb excess oil, reduce fine lines, and restore proper PH levels to your skin. Plus it contains alpha hydroxy acids, essential for reducing age spots and removing dead skin. Combined together, this is a fantastic mask for combination skin, or those suffering from adult acne. PRO TIP: Make sure you’re using raw, organic honey and raw, unfiltered, and organic apple cider vinegar to reap maximum antibacterial benefits. Combine 2 tablespoons Apple Cider Vinegar with 2 tablespoons honey. Mix until it reaches a smooth consistency. Apply with a tongue depressor or spoon (mixture will be slightly sticky! ), and let penetrate for 10-15 minutes. Wait until the mask dries, then gently wash off with warm water, and apply toner and moisturizer. Still in the DIY mood? 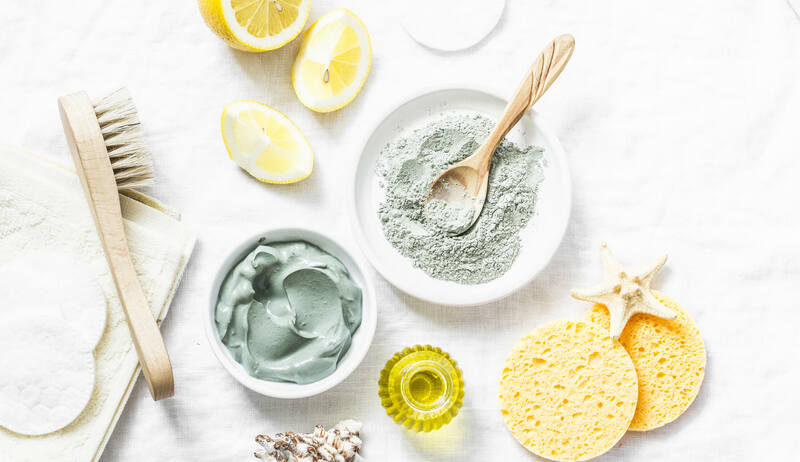 We’ve got more DIY face mask recipes, tips for using essential oils at home, a 6-step DIY spa routine, and instructions on how to give yourself an at-home facial massage! Keep up with us here for more natural and organic skin care secrets.